The Professional Regulation Commission (PRC) announced on Thursday the list of passers for Architect licensure examination (ALE) or achitect board exam administered on June 13 and 15, 2014 in Manila. Pamantasan ng Lungsod ng Maynila (PLM) graduate Rodrick Paul Velasco Mendoza Jr. topped the board 85.60 percent grade. 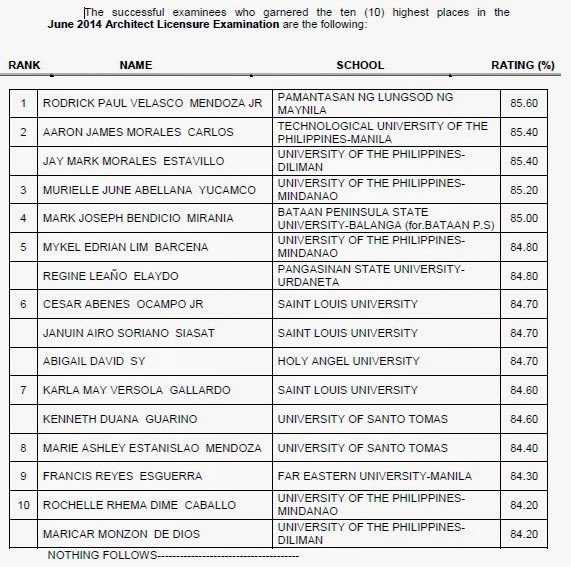 Technological University of the Philippines (TUP)-Manila and University of the Philippines (UP)- Diliman graduates tied on second spot with identical 85.40 percent grade.